This is the first image taken by the Navigation cameras on NASA's Curiosity rover. 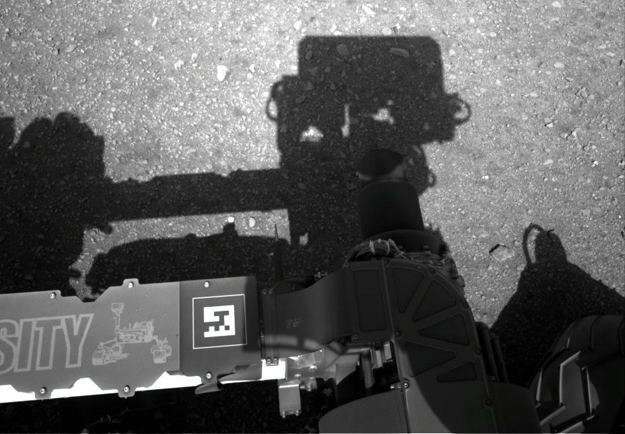 It shows the shadow of the rover's now-upright mast in the center, and the arm's shadow at left. The arm itself can be seen in the foreground. The navigation camera is used to help find the sun -- information that is needed for locating, and communicating, with Earth. After the camera pointed at the sun, it turned in the opposite direction and took this picture. The position of the shadow helps confirm the sun's location. The "augmented reality" or AR tag seen in the foreground can be used in the future with smart phones to obtain more information about the mission. This is a full-resolution image, 1024 by 1024 pixels.